Jeff Stanley at Gilman Yachts tells me he's closed on the sale of an unnamed 24.60m Cheoy Lee motor yacht listed by Marty Isenberg at Cheoy Lee North America. Built in 2002, she's been bought by a consortium of businessmen based on the Pacific Coast. Twin Caterpillar 3412 engines provide speeds up to 24 knots. 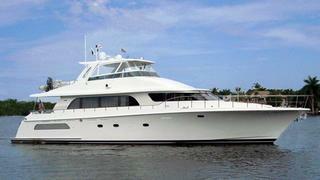 After undergoing a three month refit in Ft. Lauderdale she will make her way to the west coast of Mexico. The yacht has spacious accommodation for eight in four separate suites with a crew of three and was asking $1.6 million.